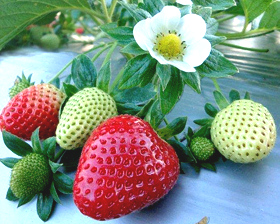 This excellent variety produces excellent quality big sized fruits in profusion on compact plants. Ideal for hanging baskets or open ground alike - and good for cloche growing too. Producing 1-1,5kg already in first year. Sow seeds January to April for summer picking or October to December for early glass production. Sow seeds on the surface of a good seed compost and lightly cover the seed with a sprinkling of vermiculite. Place in a propagator or seal container inside a polythene bag at a warm temperature of 15-21C until after germination which can be up to 21 days. Do not exclude light, as this helps germination. Stratification at 3-5C during 1-2 months in a dark place helps germination.